The rear seatbelts optional on the Edge inflate when a collision is detected, helping to spread crash forces over a much larger area of the body and limiting head and neck movement. This can help prevent spinal and internal injuries. The Grand Cherokee doesn’t offer inflatable seatbelts. The Edge has standard Post Collision Braking, which automatically apply the brakes in the event of a crash to help prevent secondary collisions and prevent further injuries. The Grand Cherokee doesn’t offer a post collision braking system: in the event of a collision that triggers the airbags, more collisions are possible without the protection of airbags that may have already deployed. Both the Edge and the Grand Cherokee have standard driver and passenger frontal airbags, front side-impact airbags, driver knee airbags, side-impact head airbags, front seatbelt pretensioners, height-adjustable front shoulder belts, plastic fuel tanks, four-wheel antilock brakes, traction control, electronic stability systems to prevent skidding, daytime running lights, blind spot warning systems, rearview cameras, rear cross-path warning, available all-wheel drive and front and rear parking sensors. There are over 27 percent more Ford dealers than there are Jeep dealers, which makes it easier should you ever need service under the Edge’s warranty. For smoother operation, better efficiency and fewer moving parts, the engines in the Edge have an overhead cam design, rather than the old pushrod design of the 5.7 V8 in the Grand Cherokee. To reliably power the ignition and other systems and to recharge the battery, the Edge has a 175-amp alternator. The Grand Cherokee’s standard 160-amp alternator isn’t as powerful. A reliable vehicle saves its owner time, money and trouble. Nobody wants to be stranded or have to be without a vehicle while it’s being repaired. Consumer Reports rates the Edge’s reliability 15 points higher than the Grand Cherokee. J.D. Power and Associates’ 2018 Initial Quality Study of new car owners surveyed provide the statistics that show that Ford vehicles are better in initial quality than Jeep vehicles. J.D. Power ranks Ford fifth in initial quality, above the industry average. With 15 more problems per 100 vehicles, Jeep is ranked 17th, below the industry average. J.D. Power and Associates’ 2018 survey of the owners of three-year-old vehicles provides the long-term dependability statistics that show that Ford vehicles are more reliable than Jeep vehicles. J.D. Power ranks Ford 16th in reliability. With 36 more problems per 100 vehicles, Jeep is ranked 28th. From surveys of all its subscribers, Consumer Reports’ April 2018 Auto Issue reports that Ford vehicles are more reliable than Jeep vehicles. Consumer Reports ranks Ford 5 places higher in reliability than Jeep. The Edge’s standard 2.0 turbo 4 cyl. produces 15 lbs.-ft. more torque (275 vs. 260) than the Grand Cherokee’s standard 3.6 DOHC V6. Regardless of its engine, the Edge’s engine automatically turns off when the vehicle is stopped, saving fuel and reducing pollution. (Start/Stop isn’t accounted in present EPA fuel mileage tests.) Jeep only offers an automatic engine start/stop system on the Grand Cherokee V6. The Edge’s standard front and rear disc brakes are vented to help dissipate heat for shorter stops with less fading. The rear discs standard on the Grand Cherokee V6 are solid, not vented. The Edge SE/SEL’s standard tires provide better handling because they have a lower 60 series profile (height to width ratio) that provides a stiffer sidewall than the Grand Cherokee Laredo’s standard 70 series tires. The Edge ST’s optional tires have a lower 40 series profile than the Grand Cherokee’s optional 50 series tires. For better ride, handling and brake cooling the Edge SE/SEL has standard 18-inch wheels. Smaller 17-inch wheels are standard on the Grand Cherokee Laredo. The Edge ST’s optional 21-inch wheels are larger than the 20-inch wheels optional on the Grand Cherokee. The Edge’s drift compensation steering can automatically compensate for road conditions which would cause the vehicle to drift from side to side, helping the driver to keep the vehicle straight more easily. The Grand Cherokee doesn’t offer drift compensation steering. The Edge ST AWD handles at .83 G’s, while the Grand Cherokee Summit 4x4 pulls only .72 G’s of cornering force in a Car and Driver skidpad test. The Edge ST AWD executes Motor Trend’s “Figure Eight” maneuver 2.6 seconds quicker than the Grand Cherokee Summit 4x4 (26.2 seconds @ .72 average G’s vs. 28.8 seconds @ .59 average G’s). 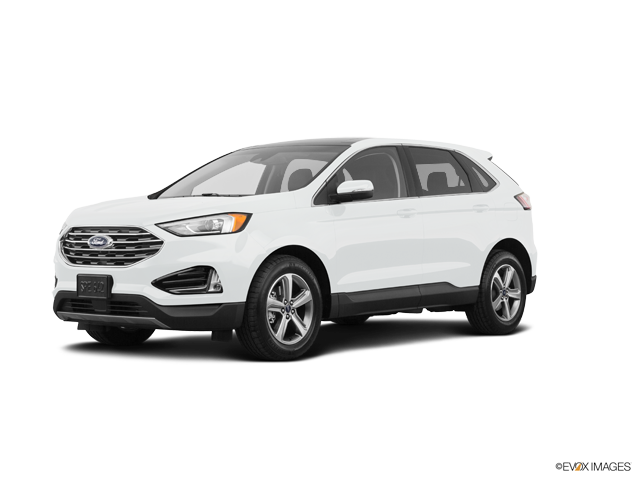 The Ford Edge may be more efficient, handle and accelerate better because it weighs about 550 to 950 pounds less than the Jeep Grand Cherokee. The front grille of the Edge uses electronically controlled shutters to close off airflow and reduce drag when less engine cooling is needed. This helps improve highway fuel economy. The Grand Cherokee doesn’t offer active grille shutters. As tested by Car and Driver while at idle, the interior of the Edge Titanium AWD is quieter than the Grand Cherokee Summit 4x4 (40 vs. 45 dB). The Edge has 8.5 cubic feet more passenger volume than the Grand Cherokee (113.9 vs. 105.4). The Edge has .3 inches more front headroom, 2.3 inches more front legroom, 1.6 inches more front shoulder room, 1.1 inches more rear headroom, 2 inches more rear legroom, 1.3 inches more rear hip room and 2.5 inches more rear shoulder room than the Grand Cherokee. The front step up height for the Edge is 3 inches lower than the Grand Cherokee (17.5” vs. 20.5”). The Edge’s rear step up height is 2.8 inches lower than the Grand Cherokee’s (18” vs. 20.8”). The Edge has a much larger cargo area with its rear seat up than the Grand Cherokee with its rear seat up (39.2 vs. 36.3 cubic feet). The Edge has a much larger cargo area with its rear seat folded than the Grand Cherokee with its rear seat folded (73.4 vs. 68.3 cubic feet). A low lift-over cargo hatch design makes loading and unloading the Edge easier. The Edge’s cargo hatch lift-over height is 29 inches, while the Grand Cherokee’s liftover is 32.4 inches. Pressing a switch automatically lowers the Edge SEL/Titanium/ST’s rear seats, to make changing between passengers and cargo easier. The Grand Cherokee doesn’t offer automatic folding seats. To make loading groceries and cargo easier when your hands are full, the Edge’s liftgate can be opened and closed just by kicking your foot under the back bumper, leaving your hands completely free. The Grand Cherokee doesn’t offer a hands-free gesture to open its liftgate, forcing you to put cargo down if your hands are full. On a hot day the Edge’s driver can lower the front windows from a distance using the keyless remote. The driver of the Grand Cherokee can only operate the windows from inside the vehicle, with the ignition on. In case you lock your keys in your vehicle, or don’t have them with you, you can let yourself in using the Edge’s exterior PIN entry system. The Grand Cherokee doesn’t offer an exterior PIN entry system, and its extra cost Uconnect Access can’t unlock the doors if the vehicle doesn’t have cell phone reception or the driver can’t contact the service. The Edge’s rain-sensitive wipers adjust their speed and turn on and off automatically based on the amount of rainfall on the windshield. This allows the driver to concentrate on driving without constantly adjusting the wipers. The Grand Cherokee’s standard manually variable intermittent wipers have to be constantly adjusted. According to The Car Book by Jack Gillis, the Edge is less expensive to operate than the Grand Cherokee because typical repairs cost much less on the Edge than the Grand Cherokee, including $8 less for a muffler, $4 less for front brake pads, $297 less for a starter and $70 less for a fuel pump.